I was in the 5th grade when the music teacher, Mrs Mapson, asked me to sing the Wells Fargo Wagon song from Music Man. She heard me sing it back to her and then exclaimed, “Wow, that’s beautiful! You could go to New York right now and make a lot of money!” Scared to death of that comment I didn’t sing ANYTHING for a long time afterwards. I took voice lessons to aid my ministry, as I was in the Catholic Seminary at the time. Mario Lanza was pretty much the guy I think every male singer wanted to be like, and I was no different. Even though I am a bass-baritone that quality of open abandon on the top notes distinguishes me from many others and I would say Lanza is responsible. Cesare Siepi and George London are pretty much in a close tie, but Luciano Pavarotti and Mirella Freni are right up there as well. My favourite role is a tie between the Dutchman in Wagner’s The Flying Dutchman and the title role in Boito’s Mefistofele. I’ve coached Mozart’s Don Giovanni at La Scala and Oper Frankfurt but I have never been fortunate enough to sing the role. What’s your favour­ite opera to watch? When you not IN the opera it can sometimes be difficult to just watch and enjoy it. Good productions and excellent singing matter a lot, but I would say Leoncavallo’s I Pagliacci is usually pretty enjoyable to watch. Who is your favour­ite com­poser? If well sung I think just about anything by Puccini will move me to tears. My favourite writer would be St Matthew, for his writing of the Gospel in the New Testament — which is extremely important to me as Godspell in high school was my first ever musical production and appearance on stage. My favourite stage director would be Jean-Pierre Ponnelle and the incredible productions he put together. My favourite actor is Laurence Oliver. Who is your favour­ite dan­cer? This is a 3 way tie between The Bible, Scott Peck’s The Road Less Traveled and Stephen Covey’s 7 Habits of Highly Effective People. This is a tie between The Sound of Music and Luther. My passion for whatever it is I am doing. 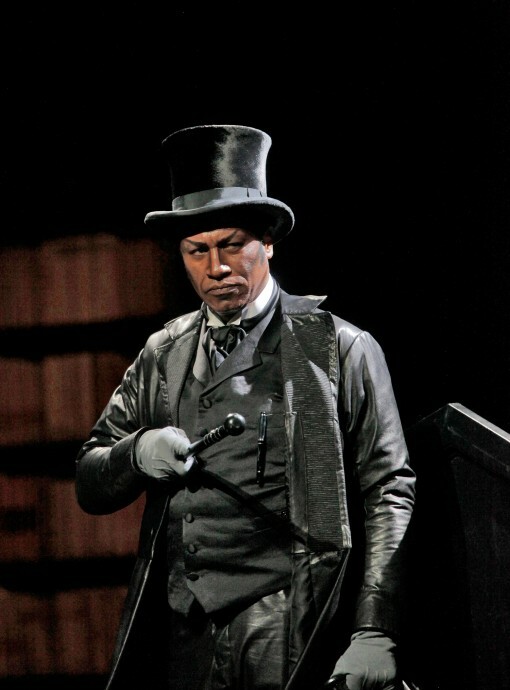 Mark S. Doss as Escamillo at the Arena di Verona – Fondazione Arena di Verona, Foto Ennevi. My difficulty at discerning the better choices in my life. Winning First Prize at the Verdi Competition in Busseto, Italy. In the 2nd grade at St Edwards’ Elementary School when I won a tennis racket in a raffle. Whatever I am doing at the moment. I would eliminate what I do poorly and accentuate what I do well, and that would put me in a constant state of change. Performing well the role of Jochanaan in Strauss’s Salome at La Scala. Occasionally eating an entire package of oatmeal cookies at a single sitting! Of the so called 7 Heavenly Virtues: Chastity, Temperance, Charity, Diligence, Patience, Kindness and Humility I find NONE to be overrated, and we would certainly find Heaven on Earth is everyone practised them. I find no acceptable occasion to lie. Brother Hugh Henderson, who inspired me to enter the Catholic Seminary. I think I visualize perfect happiness when I sing the Spiritual “Heaven Is One Beautiful Place”. Strive for excellence while pursuing the impossible dream, then find that pot of gold at the end of the rainbow – while learning from your mistakes, and know that all things are possible with God. 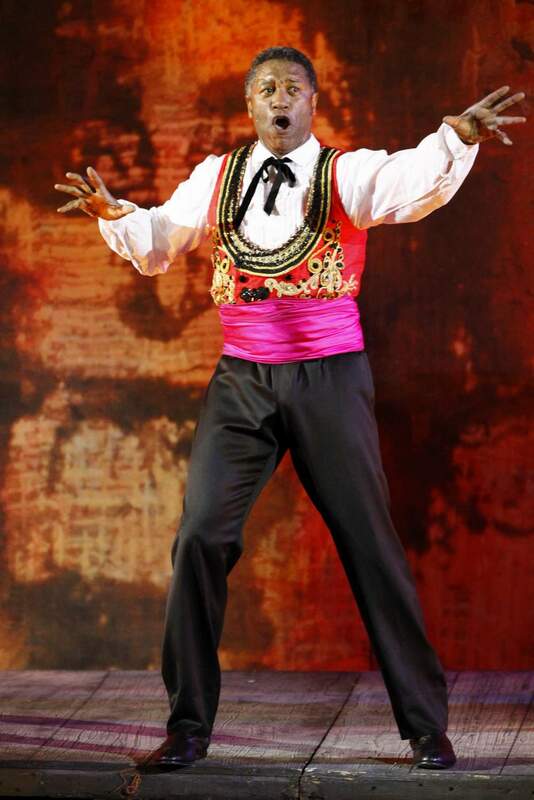 Mark S. Doss as Mephistopheles in Santa Fe Opera’s “Faust” -photo by Ken Howard. 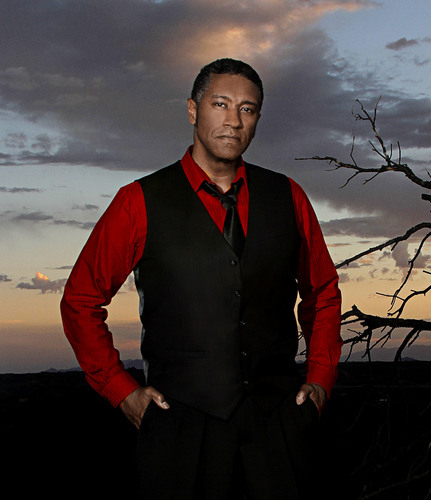 Grammy Award winner, Mark S. Doss, has sung 55 roles in more than 60 major opera houses around the world, the most notable being Milan’s Teatro alla Scala, the Vienna State Opera, London’s Covent Garden, Lyric Opera of Chicago, and San Francisco Opera. Mr Doss first sang on the stage of the Metropolitan Opera House in New York City at the age of 28, and a few months later won First Prize in the International Verdi Competition in Busseto, Italy. Adding another achievement to his list, he began the current 2012/2013 season singing the title role in The Flying Dutchman with the Teatro Regio in Turin, Italy, followed by his most performed role of Escamillo in Carmen with the same company. This past summer found him singing the title role of Paul Rayment in Nicholas Lens’ world première of the opera Slow Man in Poznan, Poland, which was done between concert performances as the cantor in Earnest Bloch’s Sacred Service in Houston, Texas, and the bass-baritone soloist in Beethoven’s Ninth Symphony at the Interlochen Center for the Arts in Michigan. Mr Doss sang the role of Thoas in Gluck’s Iphigénie en Tauride to open the Canadian Opera Company’s 2011-2012 season. The previous summer he took the stage as Méphistophélès in Gounod’s Faust with the Santa Fe Opera, and prior to that made his début with the Teatro Massimo in Palermo, Italy, as Priest Grigoris in The Greek Passion. In March of 2011 he made his début at the Vienna State Opera as Amonasro in Aida. Having sung under the batons of notable conductors such as Riccardo Muti, Lorin Maazel, Daniel Barenboim, and Robert Shaw, Mr Doss has sung with the major orchestras of Cleveland, Chicago and Philadelphia. During the 2012 holiday season, Mr Doss was once again welcomed back to Chicago as the bass soloist in Handel’s Do-It-Yourself Messiah, one of the city’s most beloved holiday traditions. Upcoming engagements in 2013 include double bill performances at Seville’s Teatro de la Maestranza in Sarka and Cavalleria Rusticana, playing the roles of Premysl and Alfio; the title role in Wagner’s The Flying Dutchman with the Teatro Comunale di Bologna (live tv broadcast), Amonasro in Aida at the San Diego Opera; and The Four Villains in Offenbach’s The Tales of Hoffmann with Opera Tokyo. Mark Doss was awarded Planet Africa’s prestigious Entertainment Award in October of 2011, and accentuating his sports related background has become a highly sought after anthem performer, singing for a Tampa Bay Storm / Cleveland Gladiators football game in Tampa in April 2012, and the National Anthems at a Toronto Blue Jays / Boston Red Sox baseball game in Toronto in September 2011. Connect with Mark S. Doss on Facebook, Google+ and Twitter.